Great location overlooking conservation area. Pool & Spa. Games Room. Internet. This magnificent villa with private pool and spa is conveniently located just 15 miles from Orlando Airport and just 5 minutes from Disney and many other attractions. Not only is it furnished and equipped to a very high standard as you would expect, but unlike similar properties, it overlooks a conservation area of native trees and fauna offering a feeling of seclusion and privacy. The villa has two en-suite bedrooms together with a further 3 bedrooms and 2 additional bathrooms. The villa has a huge open plan Great Room with a selection of family games and DVD’s, wide screen TV and internet access. All bedrooms include televisions with built in DVD/VCR. There is a formal dining area and a fully fitted kitchen with dishwasher, microwave, fridge freezer and breakfast area. A laundry room provides washing and drying facilities.Games room for the kids. Bathrooms 1 & 2 are en-suite to the 2 master bedrooms. Bathroom 3 & 4 are shared bathrooms for the other 3 bedrooms. Pool heating is available at an additional cost of £200 per week. Property fully prepared for your arrival with all bed linen and towels. The rental charge includes the following: All laundry charges and departure clean. All electricity charges. Air-Conditioning. 24 hour emergency number manned 7 days per week should any problems occur during your stay. Optional pool heating available for £200 per week. We stayed here for a week in December 2018. The villa was very conveniently located close to the Disney parks. It was spacious and clean. We didn't make use of the pool but the games room was nice. The only negative was the temperature. Initially it was too cold but we contacted the owner and they changed it to heat/cool. Then it got too hot but we were able to change the temperature. The owner was very responsive though and that was appreciated. Pool area was lovely with plenty of loungers and two sets of table and chairs . The villa backs on to a conversation area so is not overlooked which makes using the pool very quiet and private . The owners were quick and helpful in responding to queries from the start of our booking to the day we left . Thank you for leaving a review. I am glad you had a lovely holiday. Lovely spacious villa with a great pool in a wonderful location. The villa was lovely, spacious well kept with every thing we needed, kids loved the pool & it is worth paying that little extra for pool heating. We had a fabulous time and thank you. Many thanks for leaving feedback. I am pleased that you enjoyed your stay in my property. The missing pool panels and debris in the pool was a week or so following a hurricane!! Repairs are carried out ASAP but one has to wait for workmen and priority was given to properties with more serious damage. We stayed at this vacation home for two weeks July into August of 2017. The home is very spacious, beautiful, and clean. The reason we are advising caution is because the owner, who lives across the ocean in another time zone, controls the thermostat via a "nest" - guests have absolutely no control over the temperature in the house. Upon arrival it was 80 degrees in the house. We attempted to adjust the temperature to 72 degrees but to no avail. The temperature fluctuated between 77 and 85 degrees from Saturday until Thursday. We made several calls to the property manager and emailed the owner but they wouldn't believe us - the owner said the "nest" was telling him it was 75 degrees in the house and stated that he controls the temperature remotely and he had it set at 75 degrees. When we would come back at night after a long day at the parks, the temperature would be 80 degrees or higher and would go up to 85 degrees as we slept. We could only email the property owner, who wouldn't respond until several hours later, so we would call the property manager. The owner sent us an email telling us that we were NOT allowed to call the property manager after hours! Keep in mind that we had two babies with us as well. Finally after several heated discussions/emails, the owner agreed to send someone out to look at the "nest". The repairman came out on Thursday after we spent FIVE days/nights in a house that was, for the most part, over 80 degrees. After that the the temperature did go to 75 degrees, which was still uncomfortable for us since we keep our house at home at 72 degrees in the summer. We also had issues with the internet. We tried to get access using the password they provided but it wouldn't work. The property manager came out and left us a nasty note accusing us of changing the password and telling us to reset it immediately. We NEVER changed the password. We just tried repeatedly to login with their password which failed. For the past 28 years we have stayed at many hotels/townhomes/houses in the Kissimmee/Orlando area and, by far, this is the worst service we ever had, despite it being one of the nicest houses we've stayed at. We caution renters that if you have an issue during your stay, you will not be able to depend on the owner at anytime, or property manager after normal business hours, for assistance. Lesson learned: we will NEVER stay at a vacation home where the owner remotely controls the thermostat! The property has a sophisticated nest cooling/heating system like many homes in the world. The temperature is set to 75 and can be adjusted by guests 72-84 degrees although most people seem to keep it at 75 as in fact I do when I stay there. It is locked between these temperatures to prevent guests accidentally setting below 72 which is the minimum recommended as units can freeze and fail if operated at lower temperatures than this. It also defaults into an eco setting when property is unoccupied for many hours but will automatically reset as soon as you return. When set to cool to the desired temperature the unit states how many minutes until it will reach this temperature. It may have been a little warmer on arrival but it will have automatically cooled to the selected temperature within minutes. I always explain this in the arrival detail pack. I haven’t experienced guests having problems with using this system before. The management company is happy to assist with non urgent items during office hours but are available 24 hours a day for URGENT items such power failure. Internet is not considered urgent. There was nothing wrong with the system but we had it looked at and serviced to appease constant demands that there was. Unfortunately some guests have very unreasonable expectations of the Management Companies. This is not a 5 star hotel it is a budget 5 bedroom 4 bath pool home in a fantastic location. I am also happy to help guests with queries via e mail and yes there is a 5 hour time difference but I will always respond as soon as I can but most guests deal perfectly well with the Management Company. I am sure most people are aware of these type of reviews. 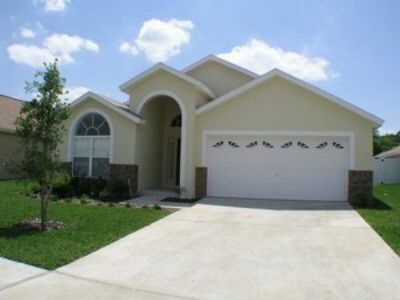 Indian Creek is just 1 mile south of Highway 192, 4 miles from Interstate 4 and just 15 miles from Orlando Airport.The villa is located on a lakeside development and is one of the closest communities to Walt Disney World Resort, being just a 5 minute drive away. Other theme parks such as Sea World and Universal are also just a short drive away. A drive to the nearest beach takes around 50 minutes. Within the community are tennis courts, children playground and a football pitch. 2 minutes away is Formosa Gardens where there are numerous restaurants, supermarket, pharmacy, factory outlets etc.